For absolutely, positively, no reason except it seemed like a good idea, I built a radio which listens to digital data from airplanes. It’s upstairs in my office, mostly sitting on the floor. The antenna is at the window. It’s not a radio in the conventional sense. There is no speaker. There are no physical controls at all. It is a dongle plugged into a credit card sized computer. Connected to the dongle, the antenna. It is a nerd’s dream. 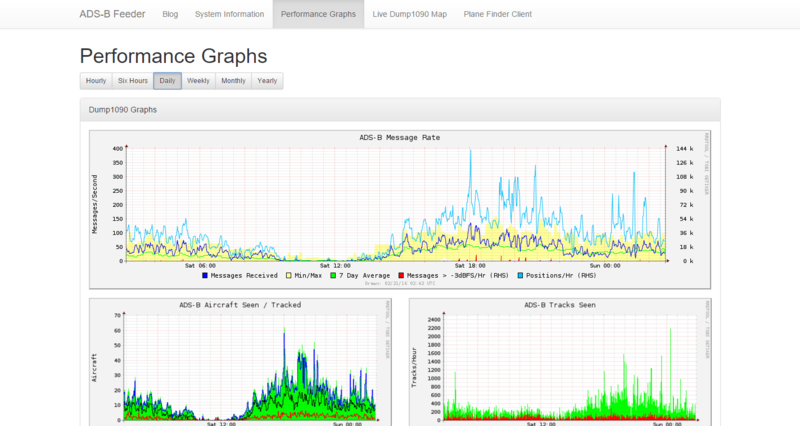 Not only can I watch the planes go by, the software spits out a bunch of interesting graphs (fellow nerds: CLICK!). OK, they’re interesting to me. I love numbers. From my upstairs office the receiver usually sees the single file line of planes heading to LAX from the east. Same goes for John Wayne Airport. Both airports land from the east and depart to the west almost exclusively–even with tailwinds. Every night a dozen or more flights head to cities in California from Mexico. At, or just after, midnight they all head back. Most are seen by my gear. There are also random flights from Hawaii to southern cities, like Phoenix or Dallas and constant traffic to the East Coast from LAX. They’re flying in single file as they leave SoCal. 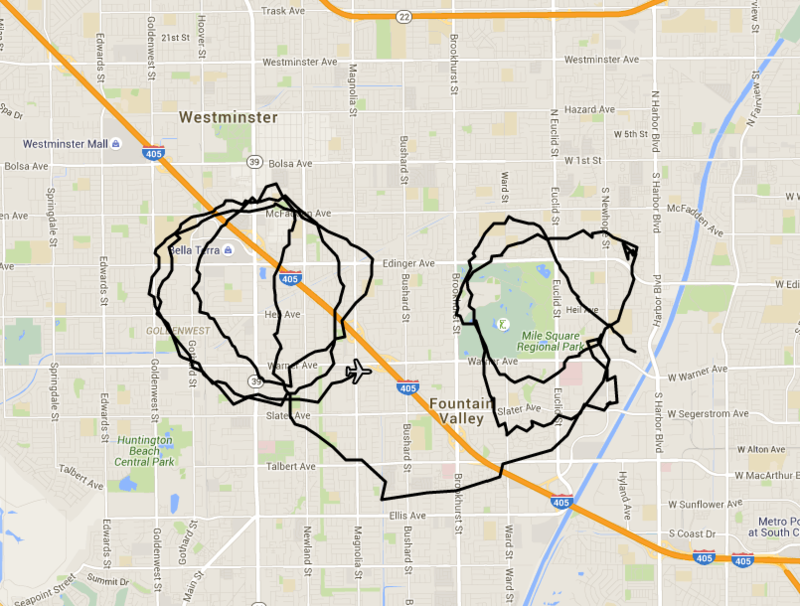 The most interesting flight patterns belong to the Orange County Sheriff’s helicopter. It can orbit a neighborhood for hours, need be. Like everyone I’ve looked up and seen planes. Now I usually understand why they’re where they are. There are a lot of people with money. There’s a sizable number of private or corporate planes. What’s astounding is how many planes I pick up. Monday’s count (it’s in UTC, so 4p to 4p) was 1,286 planes sending 111,921 position reports. I’ve worked to tweak my setup for maximum performance. Today it’s this. In 1957 I’d have been working on a Model A Ford. As one who has landed at both airports (LAX & SNA) hundreds of times, it is indeed true that the prevailing landing and takeoff direction is to the West. Orange County (John Wayne airport) is actually configured with North/South runways labeled Runway 19L/R (takeoffs and landings to the South) and runways 1L/R (takeoffs and landings to the North) These runways, are actually the same piece of pavement, the difference being the magnetic compass direction depending on which end of the runway the aircraft is pointed. LAX has 4 runways, 25L/R and 24L/R and the reciprocal being 7/LR and 6L/R This is due in large part (especially for takeoffs) because of a smaller noise footprint over populated areas generated by the aircraft. Yes, we takeoff with tailwinds at LAX…..alot. But there are limits as to actually how much tailwind is permitted. Tailwinds in excess of 10-15 knots, necessitate that the airport “turns itself around” and departures would then takeoff to the East. It’s usually a “bad weather day” in SoCal when LAX is configured for an Easterly operation….for both takeoffs and landings. In flying into and out of LAX for the past 30 years, I can almost count on one hand the number of times I’ve taken off or landed to the East. Thank you for the “nerd” graphs, Geoff! I also watch my CPU stats, but in Windows Task Manager. I would enjoy having an ADS-B receiver and use my home as a listening point for ATC audio on LiveATC.net, but it isn’t feasible. Is there a way for external users to view your ADS-B data?